London is on its way to being a key hub in Islamic finance was the conclusion of the unique Forum for International Relations Development (FIRD) seminar on Islamic Finance and Its Importance in the 21st Century at House of Lords in which The Lord Sheikh (Co-Chair APPG on Islamic Financeand President Conservative Muslim Forum), Justice Retd. 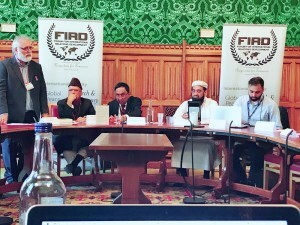 Mufti Taqi Usmani (International Expert), Qari Muhammad Hanif Jalandhry (Member IslamicIdeology Council, Secretary General WMAP), Toaha Qureshi MBE (Chairman, FIRD), Lord Qurban Hussain (Vice Chair, APPG Pakistan) and Afzal Khan MP (Shadow Minister, Home Office) participated. Toaha Qureshi MBE said that the seminar aimed to create awareness about Islamic finance, apprise of the measures and steps taken by Britain to promote Islamic finance, and to highlight the significance of Islamic finance as an alternative to the conventional financing system. He urged Lord Sheikh to promote trade with Pakistan over aid to help build the capacity of the various sectors in trade. He added that through arranging strategic dialogue and connections between the UK and scholars and academics who could provide authentic and measured education on shariah related matters, he hoped UK would become an example for other countries to follow in issuing Sukook and following Islamic finance principles. He concluded as he began his address, stating that as people sharing the same humanity, the government should not be afraid to peruse and implement elements of shariah law that can progress British society and business. Justice Retd. 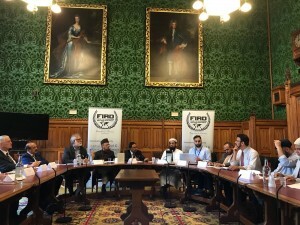 Mufti Taqi Usmani gave credit to former British Prime Minister Gordon Brown, who held a session where Mufti Usmani spoke, for announcing that the UK will be made a hub of Islamic finance. For the first time in the history of Islamic finance, the UK has given concession to Islamic banks so that they are not required to pay double tax – the UK was the first country ever to do so, it is an encouraging step and had led to others to follow suit. He clarified the misconception that Islamic finance is not only for Muslims, rather it is a financing system based on Islamic principles for the entire world to benefit from. The basic principle of Islamic finance, according to Mufti Taqi Usmani, is that it should be based on equity rather based on debt as is the traditional banking sector. He suggested that the Islamic finance sector was growing at an extremely fast rate, about 15% more than conventional banking. Mufti Taqi Usmani also informed that his organization has a detailed plan to convert a conventional bank into an Islamic bank. Taking a religious comparison between Christianity and Islam, he said that Christians are finding the model of Islamic finance just as beneficial and for Christian leadership it makes sense as the holy bible has proscribed usury. Therefore, in the coming years, he believed that Christians, especially in countries where Islamic finance is practiced, would be taking up this form of finance as opposed to traditional systems. He further opined that Islamic finance is aimed to distribute finance in a just and equitable manner which means money would not be concentrated in a few hands. Speaking on the financial crisis, he echoed the words of the World Economic Forum Chairman who said that they are at a tipping point and they must change or face decline. He suggested that imbuing Islamic principles within the financial sector would be the solution to the problems and provide much needed relief to the people. 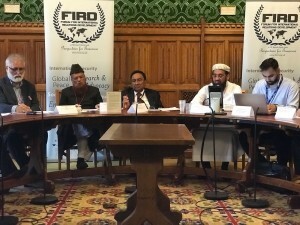 Welcoming the distinguished speakers to Parliament and thanking FIRD for arranging this timely seminar, Lord Sheikh enlightened the audience on United Kingdom’s efforts to promote Islamic finance which spanned over past thirty years. 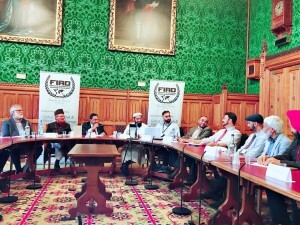 In 2013, the UK hosted the 9th Islamic Forum, which was the first time for the Forum to be held outside the Muslim world. He said that the government, Labour or Conservative, would make every effort to support such an instrumental and important initiative. Speaking on the first ever Sukook to be issued for £200m by the UK, Lord Sheikh said there was such interest in the UK that it was oversubscribed tenfold. He added that a second Sukook will be issued soon. He further added that with support and guidance from renowned scholars like Justice Retd. Mufti Taqi Usmani, London could become the economic centre for Islamic finance in the West. 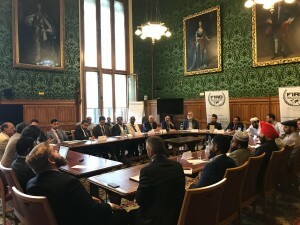 He urged the scholars to continue providing guidance and education on these important Islamic issues to foreign governments as many elements can be intertwined with British finance. Lord Sheikh also said that he is working with the Government to introduce shariah compliant student loans and start up loans. He concluded by saying that UK is the largest education provider of Islamic finance and that London is a magnet for investment for Islamic finance. Qari Hanif Jalandhry commended Britain’s role and emphasized that the UK could play a leading role in Islamic finance. 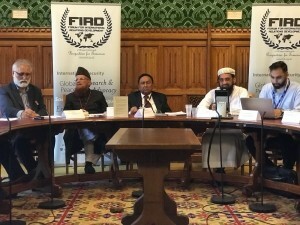 Informing the audience that the Council for Islamic Ideology had been working on this matter for many years, Qari Hanif Jalandhry said that through FIRD, he would like to invite Lord Sheikh and fellow parliamentarians to Pakistan to gain a better understanding on Islamic finance and share best practices in the sector. Ending with a message for unity and cohesion, he referred to Mr. Qureshi’s statement that as we are all children of Adam and Eve, we should all work together to bring about peace and London as a leader of Islamic Finance could play a huge part in this. 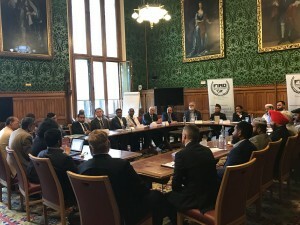 Afzal Khan MP, Shadow Minister for Home Office, said that the UK has become accustomed to a serious trend of disparity among classes and the people need support. He said that this inequality needs to be tackled and Islamic finance has a part to play in this because many poor people suffered during the credit crunch and financial crisis. He also said that government needs to be more open to the idea of exploring principles it is not used to. Umar Mahmood urged the youth to particularly participate in this as they understood the new technologies coming into play and were more conversant with elements like block chain technology and the like. He said that it was important for these types of seminars to take place to counter the view that shariah had no place in British society, whereas the former Archbishop of Canterbury Dr. Rowan Williams had the understanding that there were aspects of British society that could benefit from shariah law, which would include Islamic finance. During the Q&A session, Mufti Taqi Usmani addressed the concern that Islamic finance was being viewed upon by some as contentious given that it has been referred to as “Islamic” by saying that it can be rebranded as Ethical finance given its principles of equity. Mr Qureshi said that far right extremist groups such as the EDL and Britain First as well as the likes of UKIP were spreading misinformation on the issue by saying that the UK was becoming Islamised. Mr. Qureshi urged all parties to counter this by raising awareness with their MPs and representatives. Lloyd’s representatives talked about Lloyd’s growing interest in Islamic finance, especially in the structure of takaful (Islamic insurance) and how countries such as Pakistan were making legislative changes to better regulate this. Panelists expressed their doubts about the application of Islamic finance to the concept of crypto-currency due to the speculative nature of digital currency which could lead to a crisis. More research around the complexities surrounding its creation and value. Lord Sheikh said that it was too early and too speculative to get involved in right now, but once it is based on solid assets the government will perhaps look into it. Mr Qureshi said that other governments, such as Qatar and China, had warned against crypto currency or had taken steps to ban it, therefore some further research and consideration is required. Dr Ahmad Al-Dubayan, DG Islamic Cultural Centre, said that protection of mankind is the basic principle behind Islamic finance and money is one of the issues where people need protection the most, evidenced clearly by the problems plaguing people like debt, betting, loans etc. Dr. Simon Best, Programme Leader MSc Innovation Management and Entrepreneurship Middlesex University, said that it was a great opportunity to learn about Islamicfinance, how it links in with ethical financing and its application to social enterprise in particular. Umar Mahmood offered the vote of thanks on behalf of FIRD. The seminar was attended by parliamentarians, civil servants, academics, senior bankers, bureaucrats, students, community leaders, religious scholars and media.